As the saying goes, one man’s trash is another man’s treasure. That’s exactly why swapping, and bartering sites exist. People want to use what they have to get what they want or need without having to spend loads of money to do it! It’s an ingenious system, really, that can save you tons of money scoring the things you want in life. Most of the following websites are free to use and give you the chance to trade in your stuff or barter with others to get what you want. There are all kinds of websites that allow bartering and swapping – way more than I had thought, actually! To keep everything organized, I grouped each site by category so that you can more easily find the type of site you’re looking for. The following websites are for swapping or bartering in general. These are the ones you can use if you have several things you want to trade or look for, or if your items don’t fall within a specific niche. Contrary to its name, BarterOnly isn’t just for bartering. You can register and start selling for $5 per month, which will give you up to five listings for items to swap. Or, browse the other listings for free. However, you’ll need to post an ad with what you’re offering if you do decide you want to trade with someone. You can barter or trade goods and services on BarterQuest. Some people even trade things like cars and vacation packages on this site! You can make offers and counteroffers here, which gives you some good opportunities for negotiating. Craigslist is one of my go-to places when I have anything I want to find locally. But you can also use it to sell things, or even trade or barter with others who list stuff. The thing I’ve found about Craigslist is that you should never limit your searches to people who advertise that they will accept barters or trades. The truth is that almost anyone will accept them if you offer something that they want or need. So even if you find a listing that has something for sale, it’s worth a shot to see if the seller will let you trade something of yours to get it. 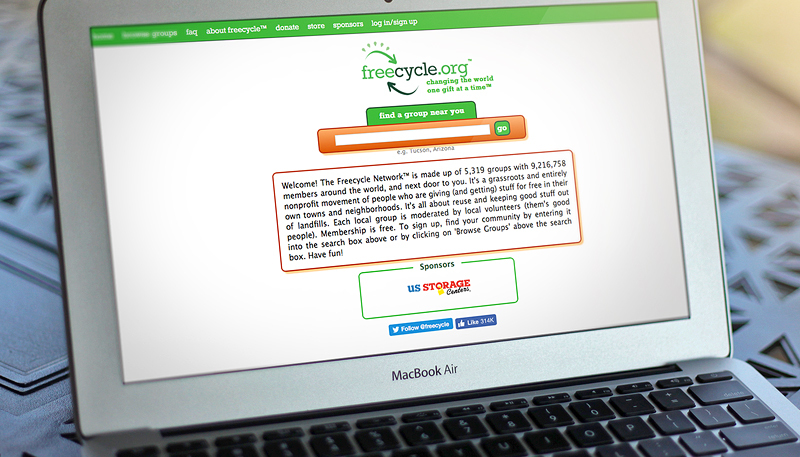 Freecycle is all about helping people give away and get free stuff locally. You can list items you have that you don’t want and browse the other local listings to see what people are giving away. You don’t always have to trade anything for items, but it might help you get some better stuff when you offer something in return. The listing will usually indicate if the lister would like something in return. Gumtree is a Craigslist-type site for those in the UK. It has its own area of the site for trading, known as the Swap Shop. This is where you can list items you want to trade and find others that people are giving away. You can use the Listia app to “sell” things you no longer want. When you sell, you’ll get credits that you can use toward the purchase of other items on Listia. Technically, you’ll never be using real money unless you choose to purchase extra Listia credits to get something you want. The ReUseIt Network has local groups that you can join to find things that other people are giving away or want to trade for something else. There are currently groups in the United States, Australia, Canada, the United Kingdom, and some other regions. I really love the concept of this one! Shared Earth helps connect people who have land to people who need it. Perhaps you have some extra land you don’t need that someone who wants to garden or farm can use. Or, maybe you’re the one who wants to do the gardening and farming! You can use this site to find land near you for free. Swap Ace lets you trade or barter for just about everything, from books to cars and everything in between. It’s free to advertise anything you want to trade, and it’s also free to browse the listings. SwapCycle is a website for UK residents to find things they want while giving away things they don’t want or need. You can contact the owners to learn more about joining the community. Swapz is a great site for those in the UK to find things they want to barter for or trade. It’s free to register and list items, and you’ll have a huge range of categories to choose from. Tradeaway is almost like a Craigslist for trades. This site is for those in the United States to find local items to swap their stuff for. Once you register, you can browse the listings or set one up yourself for free. TradeMade is an app instead of a website, but it works similarly to swapping websites. Use the app to list items you want to give away and browse what others have in stock. You can also trade services with TradeMade! U-Exchange is another general swapping site that welcomes members all over the globe. You can barter or trade anything from boats to home decorations here! Clothing is probably my favorite thing to swap online. When my kids outgrow their clothes, instead of getting pennies for them at a yard sale, I ship them to one of these websites and trade them for other clothing in their size! Rehash isn’t just for clothes – it’s for accessories too! Swap your clothing and accessories for free. The only thing you have to pay for is shipping. Swap is my absolute favorite site for swapping clothing. I’ve used it for several years now and always find excellent clothing to trade up for. Swap used to have a specific area of the site for trading that allowed you to send in clothing and set them for trading with others. Now, it works a bit differently, but still lets you swap your clothes for others. When you send in clothing, you can opt for Swap credit whenever pieces sell. Then, you can shop on Swap using your credit to basically get your clothing for free! ThredUp works similarly to Swap.com. You can send in your clothing to sell on ThredUp, but it’s a bit pickier with the brands and quality of clothing it accepts. Receive store credit for your sales that you can use to get some new pieces for your closet! Vinted lets you either sell your clothing or offer trades to sellers! What’s really cool about it is that you can use the mobile app to take photos of your clothing and create listings, making it super quick and easy to do. There are a lot of swapping sites for entertainment-related items, like books and movies! BookMooch is such a great site for bookworms to use, especially if they don’t always have the opportunity to visit the library. You can list the books you want to get rid of on the site. Then, receive offers for those books. Ship them to who you want and receive credits. Use those credits to get more books from BookMooch! Game Trading Zone isn’t just about video games, although that’s mostly what people trade here. You can also trade things like movies, gaming consoles, gaming art, and more. You can sign up for free, and there are no hidden fees to sell, trade, or list items. As you’ll notice, some of the website names don’t accurately reflect everything you can trade for on the site. Paperback Swap, for example, also accepts swaps for hardcover books, audiobooks, textbooks, and just about any other kind of book. Any books you send to someone you trade with will require you to pay for postage, but you’ll receive books for free. This site is for gamers who want to get rid of games they don’t play and try out some new ones. When someone “buys” the game, you get the points. You can then use those points to “buy” new games! Swap a CD is a place for music lovers to go if they want to rotate their old CD collection. Whenever you ship a CD to someone else, you can get a credit for one for yourself. It’s a great way to find some new music and to test drive CDs you weren’t 100% sure about buying. Swap a DVD is a much like Swap a CD, which makes sense because they’re sister companies (and so is Paperback Swap!). All you have to pay is a 49-cent swap fee when you request a DVD. If you have children involved with sports, then you can’t afford to miss out on SwapMeSports. This is a place where you can give away used equipment or trade up to something that you need a little more, from baseball gloves to football cleats. You can register and use the site for free. Title Trader focuses mostly on music, DVDs, and books, but there are a lot of categories open for trades. You earn points by sending your stuff to other users, which you can then use to request more items for free. Yes – there’s even a few ways that you can trade living spaces! If you’re into traveling the world and seeing new, exciting places, then house trading is definitely for you. I’m sure you’ve heard of Airbnb, the place that lets you find rentals all over the world and even rent your space. I’ve heard of people being creative with their rentals and trading spaces with other Airbnb hosts! It’s a good way to see someplace new, and even get some free lodging by giving up your place for a while. Couchsurfing allows you to open your home to others or find a place to stay in someone else’s home. When you stay with a Couchsurfing host, you get to stay for free! The idea is to bring people together from different cultures and places and help them see new places and have exciting opportunities. GuestToGuest is a legit home trading site. You give up your place and stay at another other person’s place, all for free. You can choose the length of your stay and the length of time someone stays at your place. You’ll get points when you host your space that you can use to stay at other places, so you’ll never have to pay a dime to do it. HomeExchange services people in more than 150 countries, so you can surely find a place to go! Just list your place, wait for interested people to respond, and then you can pack your bags and head to your new vacation spot! This is another home swap site that makes it easy to find people to trade your place with if you want a quick getaway or a longer vacation. The site works with countries all over the world! LoveHomeSwap makes it simple to find your next travel destination. Search for what you want and create a listing for your place. Then you can find other people who have an interest in a place like yours and make arrangements for traveling through the messaging system. The following sites are focused on swapping services rather than items or places. The BabysitterExchange is a site that caters to families interested in babysitting co-ops. Babysitting co-ops let you exchange babysitting times with other families. If, for example, you watch a couple’s kids on Saturday, maybe they can take your kids on Sunday. It’s basically swapping your babysitting services with others so that you can end up with free babysitting. The site makes it easy to find other local parents to swap with, or you can even create your own babysitting co-op community of parents! BizX helps savvy business owners exchange services with one another for free while building their networks. When you give a service, you can earn BizX dollars, which replace the actual cash you’d typically use to buy a service. It’s free to join, but there are small fees involved for each transaction. Skills Barter is just like it sounds – you can barter with others for their skills while giving your own! The site is free to use, and you can begin trading skills as soon as you sign up. Swap a Skill lets people with various skills, from cooking to marketing, give their skills away to others while getting some other skills in return. You can create a listing for free and tell others about your skills and what you’re hoping to find on the site. SwapRight is similar to the others in this category – display your skills, help others out, and get some help in return. There are a lot of categories to choose from here, so you’ll have an easy time finding a category for your skills and finding people with the skills you need. Do you want to barter for car privileges? Zipcar lets you do that! Zipcar is a car sharing site that saves you money over renting a car for a full day when you may only need it for an hour or so. You pay a monthly subscription to join, and then you’ll receive a card to have access to Zipcar inventory all over the world. You can then book a car for an hour or more. This site isn’t quite like the others in this list that let you trade or barter with other people. But you’re essentially swapping a monthly fee for unlimited use of cars every month, which can come in handy on your next trip to the airport! Conclusion: Get New Stuff Online! It’s amazing how many things you can trade that you probably never even thought of. Furniture, clothing, babysitting services, and even cars and homes – they’re all possible by trading online. These sites make it possible to find something you really need or want and get rid of things you don’t want (or just want to temporarily part with!). Find the treasure in another man’s trash! Have you used any of these sites to find some new things to love? Are there any favorites of yours that aren’t on this list?